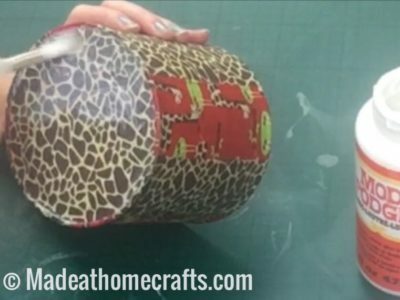 “Tin Can Craft”!!!???? This was my Craft Mind Bell striking last Christmas. My partner is so lucky that I gave him a coffee machine and, off course, the coffee pods that comes in a Tin Can. Funny enough, I had to wait anxiously for him to open his gift so I could get hold of the tin as I already had an idea in mind.. I like coffee, specially Cappuccino, but at this moment, I was more interested in the tin can 🙂 . 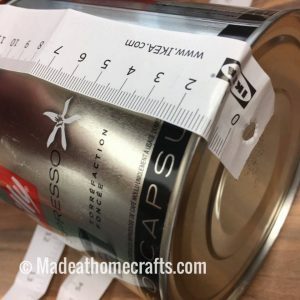 I love making handmade things from waste materials but sometimes I find it quite difficult to find tins like these (without sharp edges) when I want to do a tin can craft project. I have seen these cans in the supermarket before but I wouldn’t buy just because of the tin as the pods wouldn’t serve me… Now, they do! So, off to my craft drawers to get some inspiration for my project! 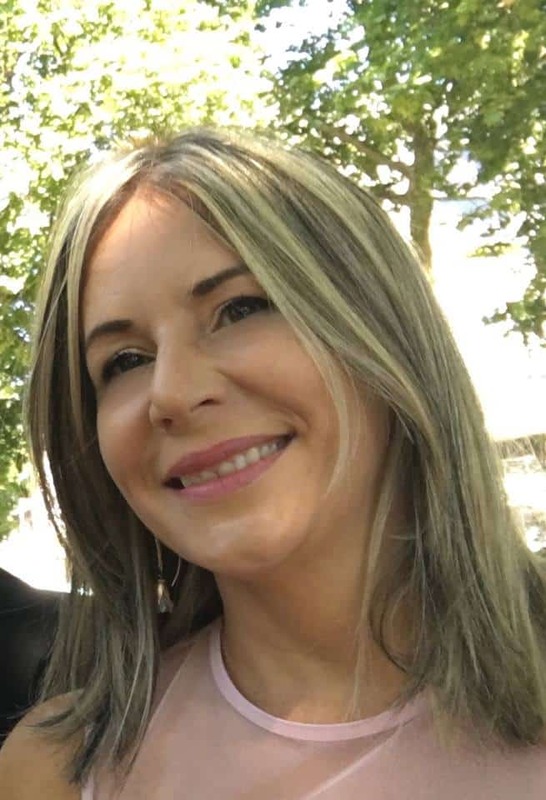 The video of this project is at the end of this post. 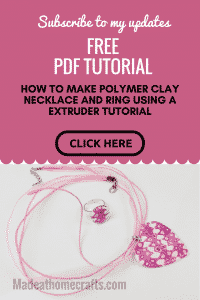 This project is an easy way to reuse waste materials and to get the kids involved. 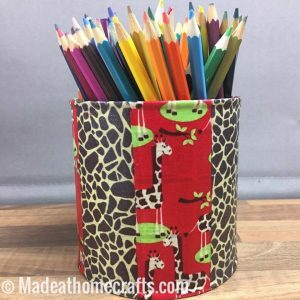 What about use it to organise your child’s colour pencils? 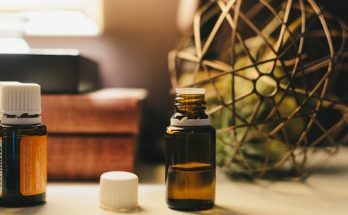 It would also be an opportunity to introduce or reinforce the idea of recycling and why we need to care for our planet! So, let’s have fun, call the kids to join in but make sure the tin can does not have sharp edges! 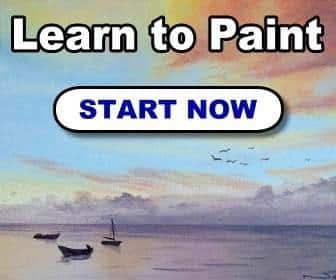 or enjoy your “me” time doing this relaxing project. 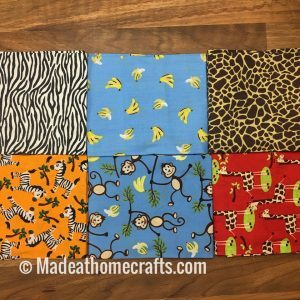 (*) I used matching “fabric fat quarters” that are small adorable little pieces of fabric that fascinate us. The fabric it is supplied in approximately 46cm x 56 (18” x 22”) pieces. 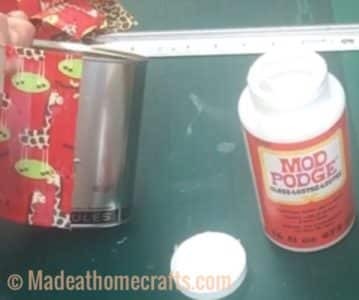 (**) Mod Podge it is an excellent product as it is specific for decoupage and gives a nice finish. You could use PVA-glue if you prefer. 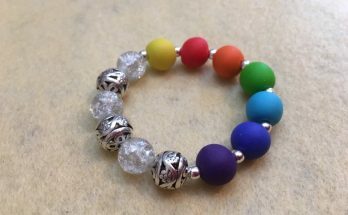 I used PVA glue in one of my other project-see here. (***) I got my tape measure free from IKEA. I get inspired when I visit my local art shop. 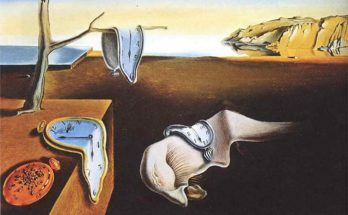 It is a “me” time, kind like a therapy where my creative mind takes the lead. My paintbrush collection is growing so I knew I needed a bigger pot to keep “some” of my paintbrushes at easy reach on my desk. At the same time I wanted something visually interesting and unique. So, that’s how my tin can project came about. 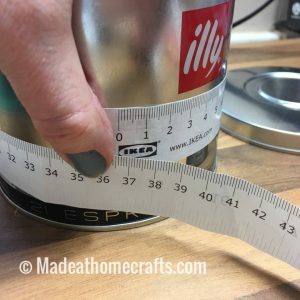 Measure the length and circumference of the tin. As I used two different fabric prints, my measurements will be divided in two. Cut the fabric in strips dividing the measurements equally. Good opportunity to try maths with your kids!! 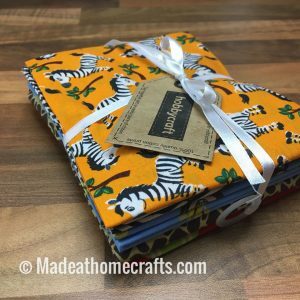 or, just choose one fabric print. 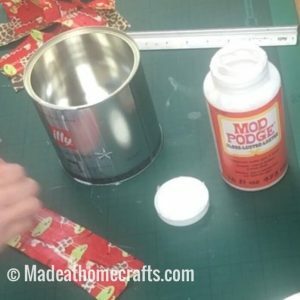 Use the Mod Podge or PVA glue to cover the area to accommodate your first strip. 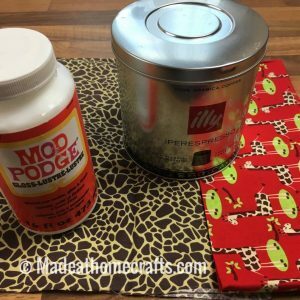 Then cover one fabric strip with Mod Podge or PVA to start. Add the strip to the tin. To have a nice finish, make sure you smooth the fabric using your fingers to take out any wrinkles that may appear. 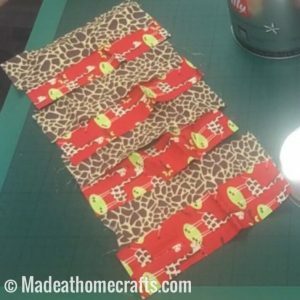 Repeat the process above using your pre cut fabric strips until the whole tin is covered. 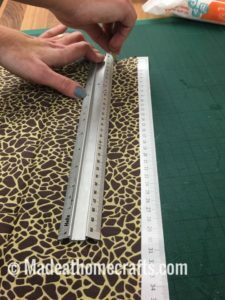 Measure the inside top edge of the tin and cut a strip of your fabric with these measurements. Cover the inside top edge with Mod Podge or PVA-glue and fit the strip inside and press with your fingers. 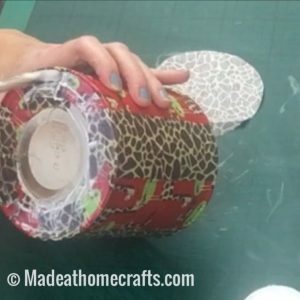 Cut a circle of fabric slightly smaller than the outside of the tin and add to the bottom. 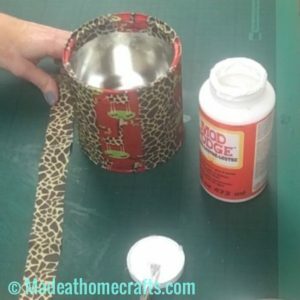 Cover the whole tin with Mod Podge and let it dry. 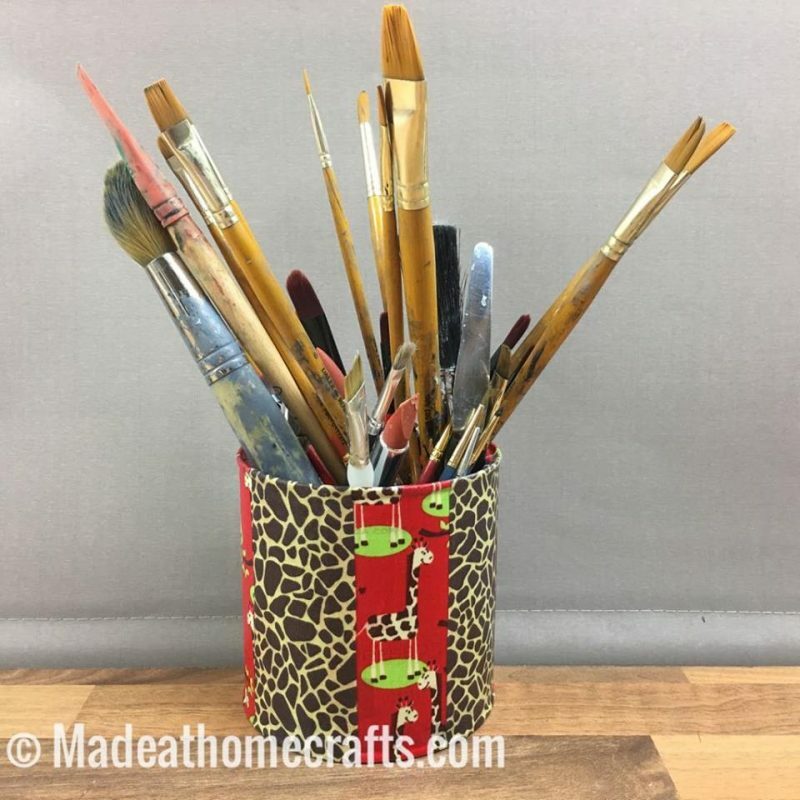 Keep an eye out for my next tin can craft project and more craft ideas. 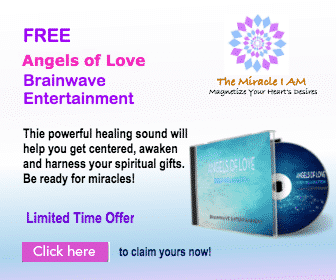 See my video below and if you have any comments or questions let me know.